Therefore, it strikes me as broken that college sports continue to be parceled out to TV broadcasters overseas. They might only be able to show two games a day, each game appealing to an extremely niche group. How do you build a following when your audience is so fragmented? The only sensible answer is on-demand, digital streaming. Make every game available and the right audience for each game will find it and watch it. 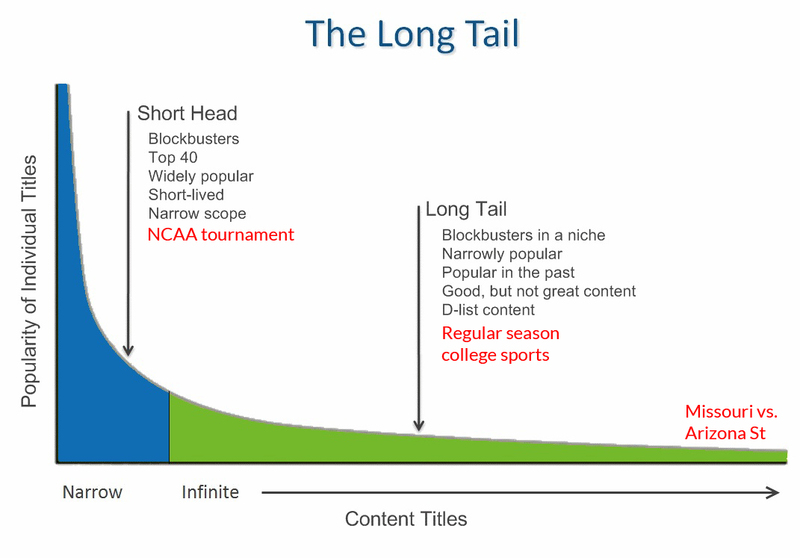 The media owner doesn’t have to calculate which two match-ups will attract the most eyeballs, because online, every game has the ability to attract its natural audience — no matter how small each might be on its own. Taken together, it can be a sizable number. It’s the difference between monetizing a fraction of your inventory versus all of it. Done right, I’m willing to bet that in this arrangement the content creator (i.e. the ACC) will be profitably better off. I can’t imagine international TV broadcasters are paying the ACC well for the privilege of showing two games nobody watches. How much am I willing to pay to watch every ACC football and basketball game online in HD? $100 per year is no problem. Maybe even $200. I paid about that amount for the NBA League Pass, and I care about the ACC a lot more than I do the NBA.